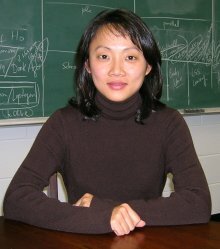 Hsiao-Wen Chen's research interests broadly cover issues concerning formation and evolution of galaxies across cosmic time. The principal goal of her research is to understand the astrophysics that regulates star formation and galaxy growth. Her expertise lies in absorption-line spectroscopy of distant light sources (Quasars/gamma-ray burst afterglows) to probe the unseen matter around luminous galaxies, and in combining absorption-line observations with galaxy survey data to understand the recycling of baryonic matter between star-forming regions and dark intergalactic medium.